Help My Sign! | Occupy M.E. I am suuuppppperrrrr excited for the March for Science this Saturday, April 22nd. I am doing everything humanly possible to attend. I’ve got extra rest scheduled this week, and a backup ride the day of the March (in case ride #1 falls through). I’ve got my wheelchair, and hydration, and I’m willing to skip the marching bits in order to attend the rally. But I need a protest sign! Recent protests have been a showcase for clever, funny, and poignant signs. I want to show the world what science means to people with ME. If you have any ideas for a sign, pop them in the comments. If you have a favorite from my list, pop that in the comments too. And if you want me to march (well, roll actually) on your behalf, tell me in the comments and I’ll put your name on the back of my sign. UNREST Until Science Cures ME! What Will Happen To ME With Funding Cuts? From Where I Sit: SCIENCE MATTERS! Give Me Life, Cure M.E. This entry was posted in Advocacy, Occupying and tagged action, funding, government, NIH, occupy, politics, protest, speaking out. Bookmark the permalink. 62 Responses to Help My Sign! Love it! I’ve added your suggestions above. Something which emphasizes somehow the huge benefits to the economy that will come from helping us get well, and how much we want to work and contribute. ‘Science can get me back into the workforce’? I was thinking about the work angle. I’m adding a combo of your suggestions above. Can I copy you? I’ll be rolling with the LA March for Science, too, in a rented wheelchair, and I’ve been trying to figure out an ME-centered sign as well. This might be a great place for people to share ideas on how to do this march most safely within our limitations. My husband will be behind my chair, and now that the march route has been figured out we’re strategizing on where to park so we can be there for the rally but not do the whole march, and also in case my health really tanks in the middle of it. I’ll also be wearing a gas mask because I’m allergic to chiles and have always feared pepper spray. Finally a march where being so dressed will be totally appropriate! Yes, I’ll have my Epipen, inhaler, and Beandryl along, and will write my allergy on my arm as the organizers suggest. Any other tips? The only other suggestion is making sure you have adequate hydration. I’m thrilled that you are going! How timely and wonderful. I’ve been thinking about this. I’m planning to participate. Being in Cambridge [MIT, Harvard, etc, and tons of scientific and pharma companies) MA, I expect scientists to be out in great numbers. Climate Change will probably be there, but what I feel may be most effective is the personal story – to have sick and disabled people, expressing how science has saved their or a loved ones life, enabled them to walk again, and so on. – those have benefited from science in medicine. However, I do not know how to mobilize these people and people with disabilities to participate. Maybe they are already organized. As for signs: I love your sign. Other thoughts. The good that science does. I modified your suggestions a little and added them above. I’m so glad you will be able to participate! I would put as many messages in 1 sign as you can. Definitely include M.E. You could plug “Unrest” too if you’re comfortable with that or Millions Missing. Until Science Provides A Cure! I’d be honored to have your roll with my name! Please include it. Thank you. I will include your name! I’ve modified your suggestions a little bit, and added them above. I’d say to keep words to a minimum to maximise their readability. Perhaps ‘Science M.E. up!’ would both amuse, and convey the message that you need it to get you out of your chair. As I’m bedbound in the UK, I’d appreciate your putting my name on the back too. Science = hope. Many of the ideas are good but keep it salient and SHORT. Too wordy and it can’t be read easily and it looses its punch. Should there be tv cameras around, short and punchy makes the point. I was reading Nancy’s comment and thought that “UNREST Until Science Cures M.E.” is shorter and punchier. The media may also be interested in more personal signs too since everyone there is already there to support science. “What will happen to M.E. Maybe on the back of your chair you could put pictures of people with severe ME and/or names of ME researchers who need NIH funding or you could do this on the back of the sign and put our names on the back of your chair. Do you have a Millions Missing tee shirt you could where or other protest attire? I have a Millions Missing tshirt but I also have a tshirt for my local march, so I’m torn. “Science != alternative facts” (!= is a programmers way of coding ‘is not’. An = with a slash through it might be more understandable to no geeks but I couldn’t make my keyboard do that. I would appreciate it if you put my name on the back of your sign as I am homebound in St. Louis. I love that Tyson quote, but not sure how to shorten. I’ve added your second idea, though! I think this is too long? I vote for the following: Only NIH $ Will Get Me Out Of This Wheelchair; Without Science, You Would Be Dead By Now; From Where I Sit: SCIENCE MATTERS!. Think about a photographer taking a picture of you in your wheelchair holding the sign. It ends up on a news feed. Millions of people see it. What will people connect with? I vote for one from the list – “Without science, you’d be dead!” True. Who could dispute that?? I like the idea of a sign but don’t like the idea of one which says ‘only science can get me out of this wheelchair’. This reads to me as (perhaps unintentionally) saying ‘being in a wheelchair is a generally agreed upon Bad Thing, and I need science to deal with this Bad Thing’. Society’s negative view of wheelchair use is part of its wider negative views of disability. This negative view of disabled people matters, as disabled people are often treated as second class citizens (I’m in the UK: http://www.bbc.co.uk/news/uk-36840850). Using a wheelchair is a perfectly valid way to move around the world. It is liberating to use a wheelchair. Without mine I’d literally be in bed all day every day because of the severity of my Orthostatic intolerance and ME. With it, I can (still limited by my ME) go to family gatherings occasionally and work from the office one morning a week. Language matters. That’s why you’re taking so much care over what your sign will say. Please don’t make a sign that is oppressive to (other) disabled people, or which suggests that – with science’s help – you can be superior to them by escaping your use of a wheelchair. I am a big fan of your blog, and have a great deal of respect for the work you do, which is why I’ve taken the time to post this. I hope I don’t hurt your feelings and you’re able to find a suitable wording for your sign. Jenni, thank you for these thoughtful comments. You absolutely did not hurt my feelings! You raise really important issues to think about. Language matters very much, indeed. Your comments about not reinforcing the idea that using a wheelchair is a Bad Thing are well taken. This goes to the heart of ableism and the social model of disability. Wheelchairs are actually just as valid a way of moving as walking with or without mobility aids. But ableism reinforces the idea that walking is “normal” and wheelchairs are not, and therefore wheelchairs are less desirable. My suggested signs about being sentenced to life in the wheelchair, etc. potentially reinforce that ableist construct. I don’t want to do that, and I don’t want to imply that everyone feels negatively about using a wheelchair. That said, people in wheelchairs have a range of views about using them. On the one hand, I am grateful that my wheelchair has helped me get to places and see things that would otherwise be completely inaccessible (like this march!). On the other hand, I do not want to need the wheelchair and it is one of the few exterior signs that I am as sick as I am. I would much rather walk. Is it possible to reject ableism and reject the social model of disability, while also hating the fact that I need a wheelchair? It sounds inherently contradictory. But I don’t hate my wheelchair because I accept social messaging that disability is bad. I hate my wheelchair because I miss being healthy. And I want that health back again. I’m striking through my two ideas that portrayed wheelchairs as undesirable and negative, because I agree with your points on ableism. But I’m still pondering the rest of it. Wheelchairs are tools, and I think it’s ok to hate needing one. The real issue is not pushing that negative view on others, and not reinforcing the rampant ableism in our culture. Hi Jennie. Thanks for your reply and for ruling out those signs. I appreciate it. I’ve often wished I wasn’t sick with ME, but I can’t remember wishing I wasn’t a wheelchair user (although it was a ‘buy one, get one free’ deal). I work in health and safety and I see my wheelchair as a control measure to mange the risks from walking while having severe ME. It’s a part of the solution, not a part of the problem. If you said ‘Jenni, you can be cured of ME, but it will cost you your legs; so you’ll be physically healthy but a wheelchair user’, I’d take that deal. I do want to reduce my health impairment (ME symptoms), but that doesn’t mean I would necessarily get, or need, a reduction in how disabled I am (by society). So yes I think its possible to reject ableism, accept the social model of disability while also not wanting to be sick and hoping for treatment for your impairments. But its quite a nuanced argument requiring precise use of language, and – like the terms ‘hazard’ and ‘risk’ – ‘disability’ and ‘impairment’ are often mistakenly taken to mean the same thing. You’ll need a MUCH bigger sign if you’re going to get that message across! I’ve really appreciated your insights, Jenni. Thank you. I hope I’ll be more aware, kind, compassionate, and also just plain unaffected in the ways I interact with people differently-abled. I am grateful that renting a wheelchair this weekend will enable me to participate in the March too. UNREST! till Science cures M.E. 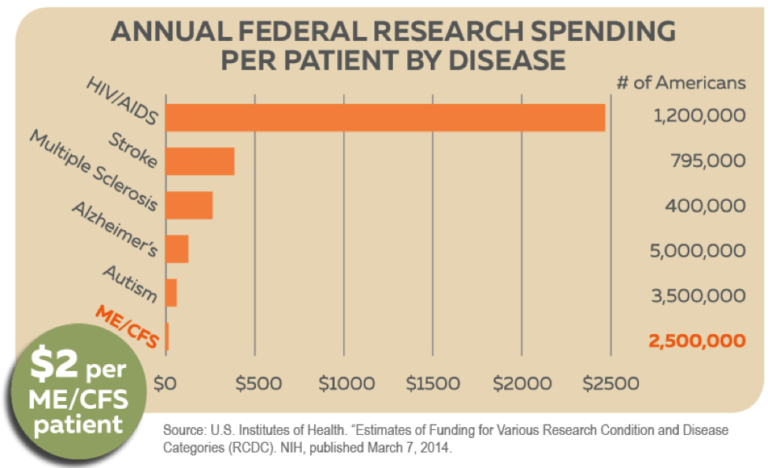 NIH FUNDS = RESEARCH = ME/CFS CURE! I think we have to appeal for NIH funds and mention our disease. Lots of people will have signs calling for science, research, etc., in general. But I think we need to bring up our disease specifically. Thank you so much for doing this, for representing our community. Please add my name to your list. I wish I could go to D.C. I added your suggestion in modified form, and I will gladly add your name to the list! You could also add NIH so that the second line reads “NIH Science Enables”. And wear your Millions Missing t-shirt. And wear your local march t-shirt. Can you put a Millions Missing Poster on the back of your chair? I love these! Added. I could put a Millions Missing poster on the back of my chair, but I expect it will be blocked by the person pushing my chair. Please roll on my behalf. Vickie Selleck, MA. Thank you!!! Was tempted to just go punchy with ” science makes sense ” but ME needs to be there I think, unless the #millions missing T shirt is enough to carry that message. I am in the U.K. So hope you don’t mind an outsider suggestion. Thank you for all that you do. Take care. You’re not an outsider! Added! Without science, ME/CFS could become anyone’s future without future. I like the message, but this seems long. How about: Without science, my present could be your future. It doesn’t mention ME, though. What do you think? funding NIH adequately so the ME/CFS funding isn’t off the budget. And using “4” is common in signs. I like Science > Alternative Facts or UNREST til Science Cures M.E. Maybe find a way to include an ME/CFS-related hashtag if you use one that doesn’t specifically address the disease? Would you please add my name to your sign? Sally Jones’ graphic drawings are all so powerful – you could choose any one of them to make into a sign, or to affix to the back of your wheelchair as a billboard. In fact, I’d suggest not only holding your hand-held sign, and sporting your billboard on the back of your chair, but also wear another sign around your neck, and have the person pushing you wear a sign on the back of their shirt or jacket. The more you can prompt people to ask, the more you can help people understand, the better for all of us. Jennie, I can’t wait to see what you chose to do for your sign; there were so many good ideas. Thank you for going and including us. I want to tell you to have fun but that seems wrong in a certain way since no one should have to be doing what you’re doing. Still, I do hope you have a good day and fun. Mostly, please take care!